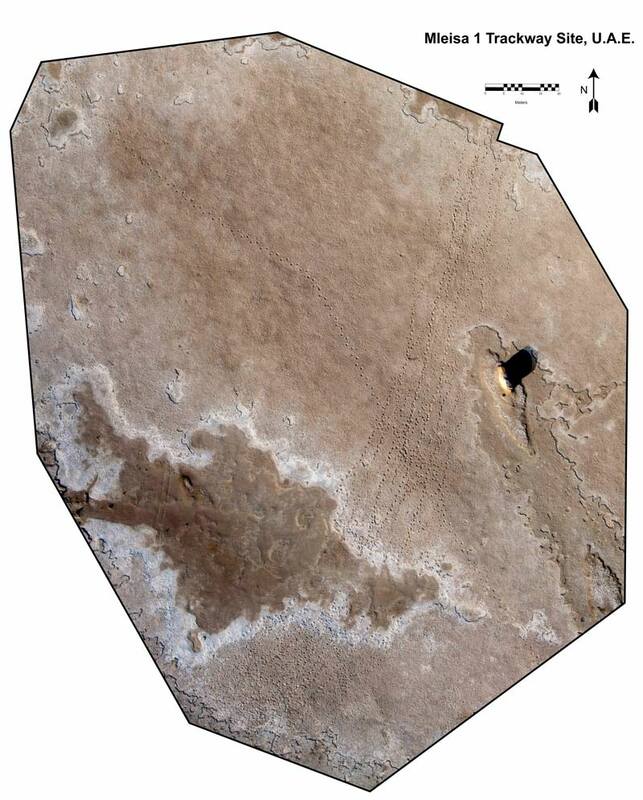 An areas with thousands of fossilized tracks from the United Arab Emerites has been described in the journal Biology Letters. Additional background information about the find can be found HERE. The tracks have been described as having been formed by an extinct species of elephants and are possibly the largest continuous set of trackways discovered to date of any animal. Analysis of the tracks has allowed scientists to estimates of the size and gate of an animal as well as their potential social relationships to each other. The evidence found at this location strongly suggests that the tracks were formed at one time and represents a herd of extinct elephants that behaved much as modern species behave today.s. In the image above you can see multiple sets of tracks that on a north/south line and a single set of tracks that crosses those tracks. The scientists investigating these tracks think it is likely that these two sets of tracks were produced at different times as the one overlaps the others. The multiple sets of tracks run parallel to one another indicating that this was a group of 13 or more elephants that were traveling together as herd. By measuring the distance between footsteps for each set of tracks the authors of the paper were able to estimate the size of each animal and thereby showing that there were a mixture of sized elephants typical of a modern day elephant herd. A close up of some of the elephant tracks preserved in rock. In the left hand image you can a small outcrop of rock that has not eroded indicating that this entire area was at one time covered by at least this much rock which has eroded over time, probably by the action of blowing sand. The prints are found in one layer of rock (TL) and there are thin layers of rock (TL+1 and TL+2) that lie just above them that have not completely eroded in all locations thus obscuring what would be an even larger area where the tracks are likely preserved. I am not sure how young earth creationists will respond to these tracks. These rocks are very young by modern geological estimations (7 million years) and so fit into the very late formation rocks of a global flood but it seems unlikely that creationists will argue that a herd of elephants was taking a peaceful stroll on top of newly formed sediments that sit above 20,000 additional feet of fossil bearing layers of rock right at the end of the flood. On the other hand, if these record a post-flood group of elephants how then were these many layers of rock (in the surrounding area that are hundreds of feet of rocks that sit above these rocks present that quite evidently covered this set of tracks at one time before being eroded) deposited on top of these elephant tracks?